The ten beautifully crafted carol arrangements in this collection highlight the expressive nature of Lloyd Larson's piano writing. 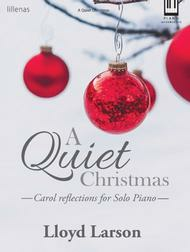 Perfect for Christmas Eve services and personal worship, these selections will serve well as preludes and offertories, as well as quiet meditations and reflections on the birth of Christ. Some of the arrangements present a small challenge but are easy to pick up. They are quite lovely and I have used "The Wexford Carol" as an offertory and received several compliments. Lovely arrangements. the melody. They change around a lot, and there are many key changes within each piece which can seem a bit trite, but also is annoying when you're mostly sight-reading for Christmas events. Overall, this music is nice for background or for your own doodling.